Calculating workshop ventilation efficiently: how much power is needed? Oversized extraction units and workshop ventilation systems, as well as incorrect planning of the airflow, can be harmful: in addition to effective work safety, companies are also concerned about cost-efficiency. The correct sizing and planning of the ventilation system is therefore crucial. There are ways of calculating the correct size. However, experience with welding fume extraction is equally important. 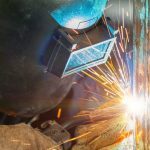 In welding companies, there are certain cases in which capturing the welding fumes at the source may not be feasible in practice. For example, when welders regularly switch welding stations, the welding stations are far apart or when large workpieces are being welded. That’s where the workshop ventilation comes into play, which can close safety gaps such as these. It is also used to ensure a clean working environment for all employees in the workshop, and keep the building and machinery clean. A workshop ventilation system is, however, only supplementary and cannot replace the capture of welding fumes at the source. This is because the German Ordinance on Hazardous Substances requires welding fumes to be captured as fully as possible, and for any hazardous substances to be removed. 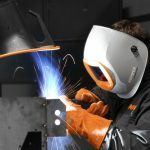 For cost-conscious welding companies, investing in a workshop ventilation system does not result in an immediate increase in productivity on paper. For this reason, they will be anxious to leverage the technical expense for maximum efficiency and effect. This requires the exact calculation of the available facilities before installing the workshop ventilation system. To make the calculation, the area (length by width) and height of the workshop, as well as the number of welding stations, are vital. In general, a height of approx. six meters is used, as welding fumes do not rise any higher than that, and it is the lower section of the workshop that needs ventilating – after all, hardly anyone actually works at such heights. In practice, an air exchange rate of five is common. 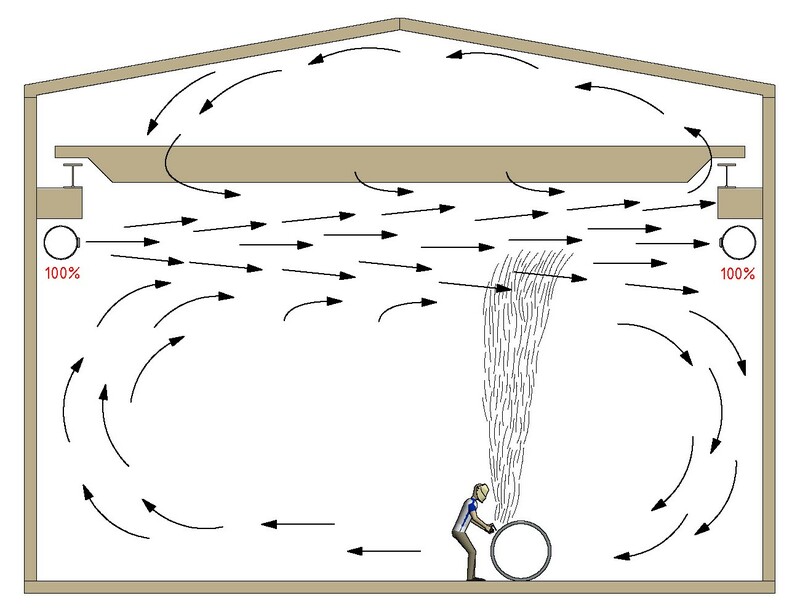 This specifies how often the air volume of a room is replaced with fresh air every hour. The air exchange rate must be adequate enough to remove harmful substances from the air in the room, or to replace it with fresh, filtered air. 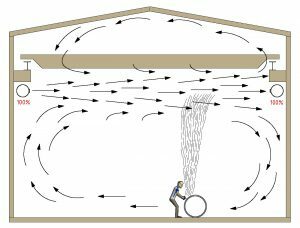 Workshop ventilation may also be affected by disruptive factors such as cross flows. These often occur in industrial workshops due to open doors or gates and cooling or heating fans. Cross flows not only disrupt the dispersal of hazardous substances in the air, but also impede the efficiency of extraction units. This can result in air turbulence in the work area. 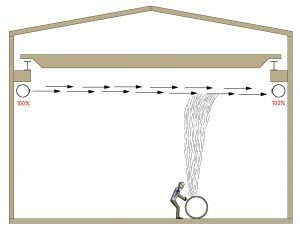 Ideal functioning would look something like this: Air is blown in from the left side, the air current remains parallel (like a laser beam), picks up the rising welding fumes and exits via the pipe on the right. In reality, however, the air current picks up the surrounding air, disperses with an angle of approx. 30 degrees, and flows towards the extraction pipe. As a result, the volume of the air current is no longer 100 percent, but 200 percent or more. The extraction pipe, however, only has capacity for 100 percent, so the rest of the air builds up in front of the wall and escapes upwards or downwards. When the air escapes upwards, it’s not a problem as no one is working there. But when the air escapes downwards, it carries the welding fumes back down with it, putting employees at risk of breathing them in. This type of ventilation can negatively impact the air quality in the breathing zone. The negative effects can be counteracted with displacement ventilation. This process involves supplying more than half the air to the lower section of the room, where it displaces the welding fumes from the area where employees are and replaces it with filtered air. The push pipe is only used to push the welding fumes slowly towards the extraction pipe. As a result, the concentration of welding fumes is higher there. However, it cannot be said that the fumes have really been “captured”. This only happens when the fumes are extracted at the source by means of a vacuum field. A general example: In a 25 by 40-meter workshop with a ceiling height of six meters, there are five welding stations. A technical workshop ventilation system should be designed to achieve a volume flow of at least 30,000 m³/h – that’s an air exchange rate of five. This means that the total air volume of the room is supplied or replaced five times per hour. Systems with high air exchange rates are often very expensive as they require a large amount of energy to replace the air at such a frequent rate. Furthermore, the pipes are often too thick and the workshop may become so drafty that it has a negative effect on the work. 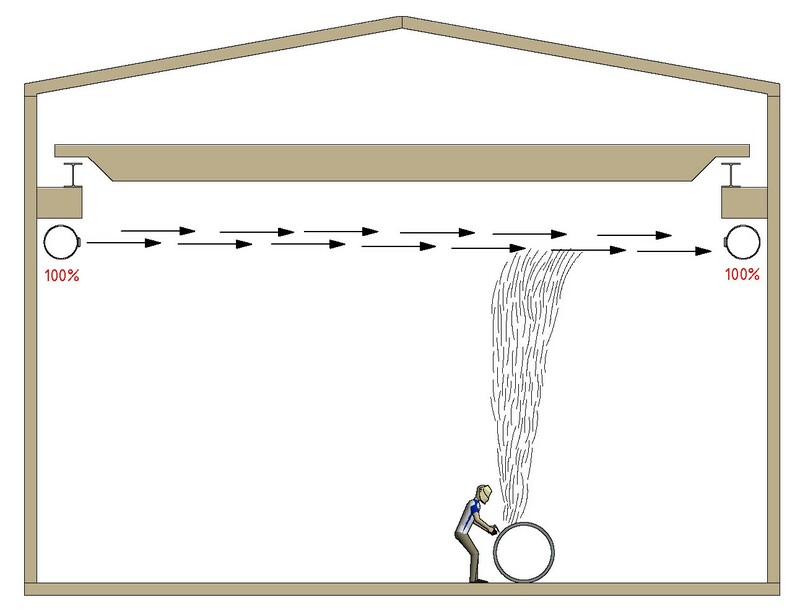 In the example described above, however, the workshop ventilation should only be regarded as a supplementary measure. On its own it provides insufficient protection to welders and exceeds occupational exposure limits. 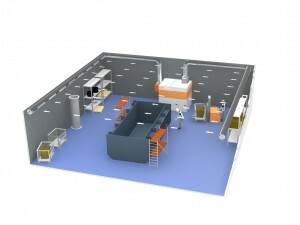 For example, if the workshop were equipped with a central extraction unit, a volume flow of approx. 6,000 m³/h would be needed for extraction at the source. 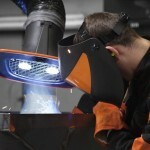 This is primarily because the welding fumes are extracted only a short distance from the extraction hood. Spot extraction at each of the work stations requires an approx. 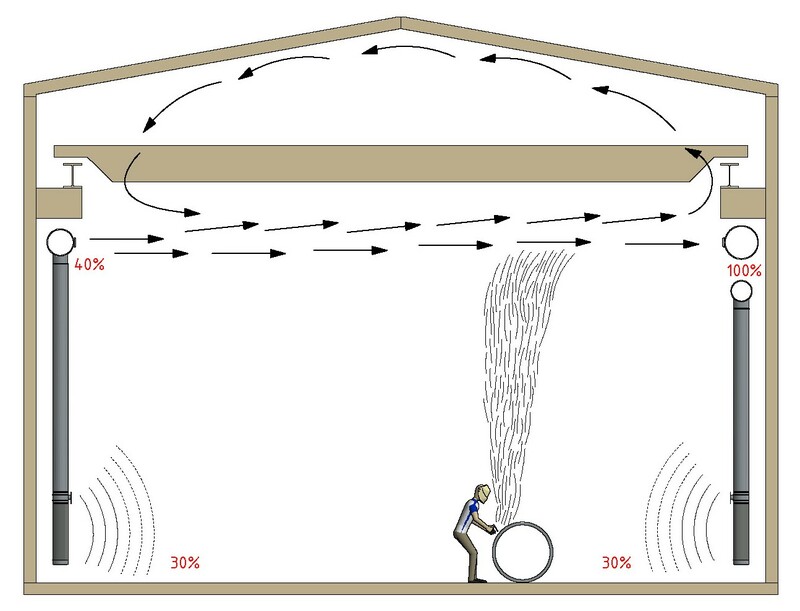 700 to 1,100 m³/h volume flow. As a result, our example would require only a fifth of the power, which would yield noticeable savings in energy and costs. In practice, it is challenging to calculate the required air exchange rate with precision. When doing so, factors such as welding current, duty cycle and spatial distribution in the workshop play an important role. Often, however, these specifications are missing or are only available as estimates. Usually, only the number of employees and welding stations, as well as the processes used, are known. This is insufficient for a precise calculation. Methods and calculation processes for configuring the layout of a workshop ventilation system are not “one size fits all.” Alongside framework conditions within the welding company that can only be roughly estimated, planning requires a lot of experience and ongoing dialog about the technical issues. A high degree of professional expertise and advice prevents errors and ensures that the workshop ventilation runs smoothly.